UbiPark co-founders Bryan Goudsblom and Mosstyn Howell are among the latest recipients of the City of Melbourne’s Small Business Grants. In an effort to boost small business in Melbourne, the grant has seen 15 lucky start-ups and local businesses collect grants worth more than $260,000. The funding is provided to innovative companies seeking to expand their operations. 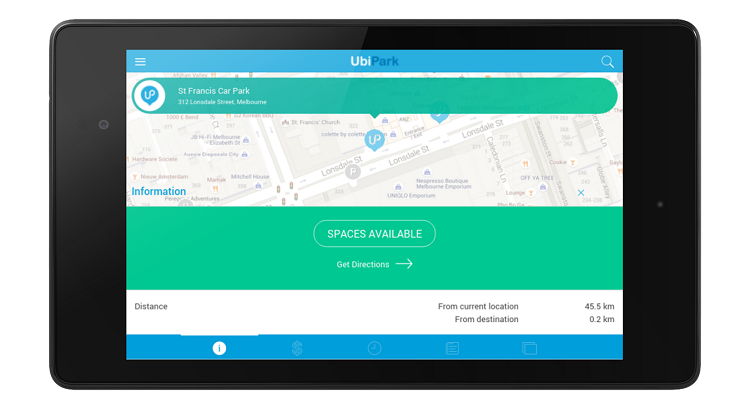 UbiPark is a recently launched mobile parking app designed with three core objectives in mind: to make parking a much better social experience for the parker; to increase the utilisation of the car park for asset owners and operators; and, to alleviate traffic and parking congestion in our major cities. The co-founders unique business model and core objectives stood out amongst the 129 applicants vying for small business funding. “The grant money will go a long way towards helping us reach our goals however gaining recognition and endorsement from the City of Melbourne also provides immeasurable brand value,” explains UbiPark co-founder Goudsblom. “Being aligned with the City of Melbourne’s plans to actively come up with sustainable traffic solutions to reduce city traffic congestion and parking related issues definitely placed UbiPark in a strong position to secure the grant,” he said. In a recent press statement, Chair of Future Melbourne Economic Development portfolio, Councillor Kevin Louey, said the vital investment directly supports the future of small business in Melbourne. Since the program began in 1996, 351 small businesses have been the beneficiaries of $7.5 million in financial support.